Dave Rimington was my football hero and the man I modeled my play after. In the spring of 1999, I was at a real crossroads in my still very young life. I was twenty-two years old and trying to build the confidence needed to muster up a football comeback. I had missed the previous three college football seasons with a severe stomach illness that had left me 75lbs lighter, three years weaker and atrophied from no exercise, and seemingly a lifetime removed from the sport completely. My redshirt freshman year in 1995 was my first and looked to be my last season of college football I would ever play. My career was over pretty much as soon as it had begun. Now in the spring of ’99 after years of GI specialists, naturopaths, nutritionists, herbalists, acupuncturists and a long list of other “health practitioners” with credentials or lack thereof not worth mentioning, I was here. The end of the line. If I was ever going to play again, I had to do it now. I had no more time. My college eligibility clock was about to run out. Then it really would be over forever. No more, “let’s give it one more year to see if it settles back down.” If I ever wanted to play football again, it was now or never. I had to deal with my stomach issues instead of hoping they would go away. A big part of my comeback was going to be trying to figure out how to manage the pain and other symptoms I was dealing with daily due to food irritation. How in the world was I going to put 75lbs back on and build back my strength when most foods left me laid up bloated in bed for hours? That was one problem – and how I dealt with that is a different story for another time. The other part was motivation. Being so far removed from every single aspect of football life for the past three years had left me very low on confidence. I was an outsider again, on my own, needing a ton of emotional ammo to power my mental drive back. I went to work building my fuel. I’m an extremely impressionable person. Luckily, I know that about myself and can use it to my advantage. As I once had done as a teenager, I began surrounding myself with quotes, images and anything I else I thought would keep me primed and focused on the daily work ahead. It kept me on track, motivated, and believing that this all might be possible. 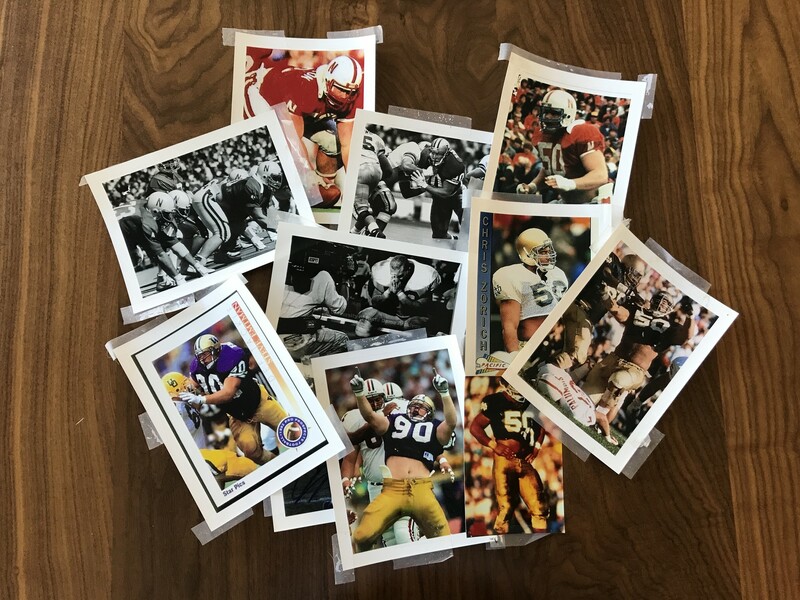 I had more Sports Illustrated and Streets and Smiths photos of offensive linemen cut out and on my wall than probably any other twenty-two-year-old in the world had, or ever should probably have. I had all the motivation I needed, but I thought I’d take a stab at adding a jewel in my wall-collage-made-crown. At the age of twenty-two, I decided to write my football hero. 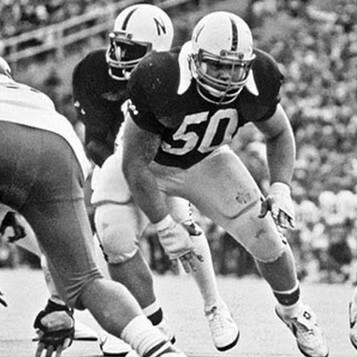 Dave Rimington is widely regarded as the most dominant center to ever play college football. He was a consensus All American in both 1981 and ’82. He is still the only two-time Outland Trophy winner in college football history. He was voted the Big Eight Conference player of the year in 1981, and Conference Offensive Player of the Year in 1982 (Both being the only times an offensive lineman has ever received those awards in that conference’s entire history – and he was a center at that!) Dave even has a trophy named after him. I mean come on?! (The Rimington Trophy is awarded each year to college football’s most outstanding center.) He is a true legend of nearly mythical proportions. He not only anchored those great early ‘80’s Nebraska offensive lines but he also followed on the heels of another legendary center Mike Webster, in spearheading the early wave of elite weight training for football players. Rimington was a beast. He was everything I wanted to be. Sadly, I never even saw him play. I was too young. By the time I was really watching football, he was finishing up his NFL Career with the Philadelphia Eagles. Back in the late eighties, the only games we would get outside of the Monday Nighters were whomever the Seahawks would be playing, plus another NFC or AFC west coast game. Oh, how times have changed. 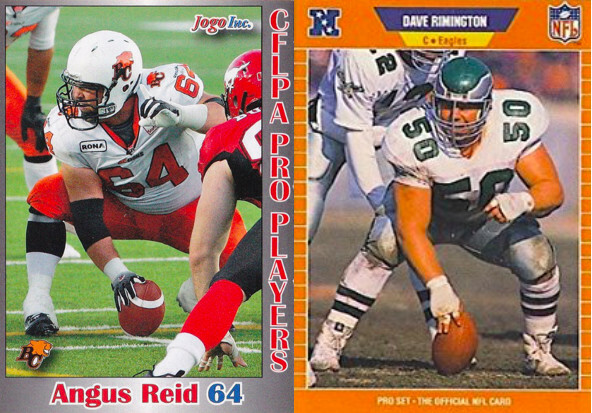 Everything I knew of Dave Rimington was handed down the old-fashioned way. My oldest brother Mark would tell me tales, probably relaying ones told to him by his old coaches. I dug through old Sports Illustrated’s, Football Digest’s, Street and Smiths, and any other old media outlet to find and read articles and cut out pictures of him. Later, a few years after this, when the internet became more sophisticated, I ordered old game film from Nebraska. (Yes, I’m strange. No, but that’s how impressionable I can be and how inspiration can help motivate me to keep pushing forward) The film did not disappoint. I finally got to see what all the worship was really about. In fact, it did what is very hard to do in this world anymore: it impressed me more than the hype. Dave Rimington was my standard; he was THE standard. So, I wrote to tell him that. Please remember, I wasn’t ten years old. I was twenty-two. He wasn’t in high profile and the prime of his career; he was 10 years retired. Both sides of this must have made for an interesting reaction from Dave when he first opened and read what I had to say. I let him know who I was and that he had long been a hero of mine, even though I had never gotten to actually see him play. I’m sure I went into far too much detail (a problem of mine) about my situation, and my hopes and my fears of attempting this comeback. How football meant the world to me, and my all-consuming dream since I was a teenager was to play professionally. I’m certain I rambled on about a ton of other useless stuff that I’m sure meant absolutely nothing to him, but at the time for me, seemed important to share. I really can’t remember if I actually expected Dave to write back or not. I think I felt it was good enough to just make sure I let him know what an impression he had made on me and how he would be a big part of my inspiration through this comeback journey. That was that. 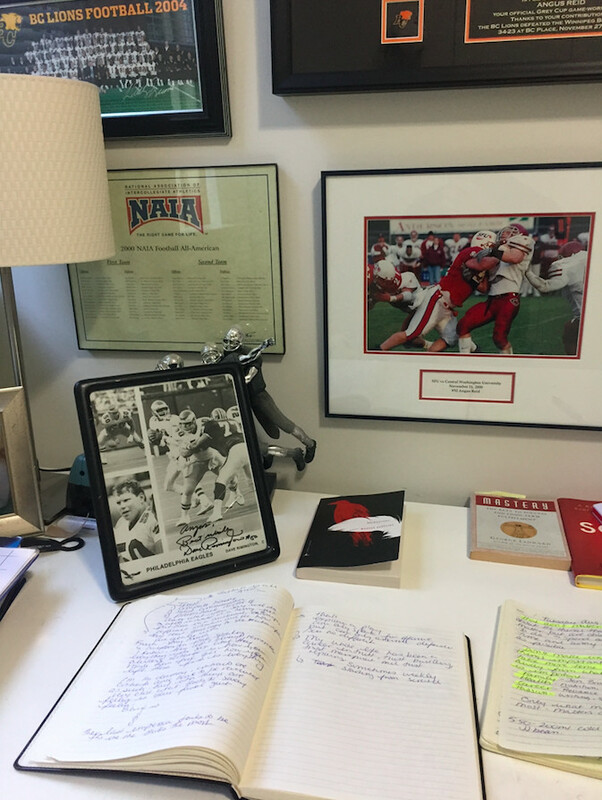 I sent off the letter to the Boomer Esiason Foundation headquarters in New York, where I read Dave was president, and I got started on my mission. About 4 weeks later a thick cardboard filled yellow 8x10 envelope arrived at my door. The return address read The Boomer Esiason Foundation. No way?! Seriously?? He wrote me back! I was so excited that you would have thought I was opening a scholarship offer or a pro contract. That’s what this meant to me. That’s what heroes can mean to some people. There were two separate documents. A hand-written letter and an 8x10 black and white multi-picture piece. The Christmas morning child in me jumped right to the photo. A simple, slick, high gloss, old school black and white. It was divided into three different takes of Dave. Two action shots and a sideline, helmet-off look. It was Dave at the end of his career as an Eagle. As much as I would have loved a Nebraska pic, how could any fan argue with this? It was as if I had opened one of Willy Wonka’s bars of chocolate and found the golden ticket! 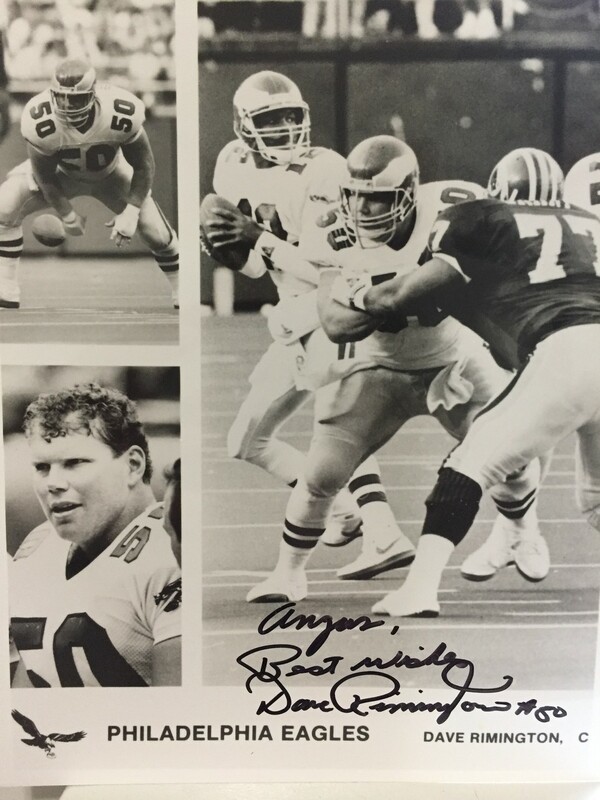 The picture was autographed and personalized to me with a clean and straightforward – Angus, best wishes, Dave Rimington. A truly stock autograph I know, but none-the-less, that became exactly how I signed every single photo and card throughout my entire career. As I said before, I wanted to be like Dave. The hand-written letter was more personal. He thanked me for writing and being a fan. He reminisced a bit about fond memories of his playing days and how great football had been to him. Then he gave me what I really wanted and needed. He wished me the strength to pursue my dream, to do whatever I have to do to be happy. There was no formal advice, (how could there have been?) just sincere sounding words of encouragement and support. Who could ask for anything more from somebody I had never met and who knew very little about me. It was above and beyond what I could have ever asked for. That simple one-page note and autographed 8x10 probably took Dave all of 5 minutes to do and he probably has zero recollection of ever even doing it, and that’s the whole point. From that moment on that 8X10 was framed and sitting proudly on my bedside table. It was the first thing I would see when I woke up and the last thing I would look at before going to sleep. Of all the inspiration, I had papered my walls with, this was the crowning jewel. I went to work on my comeback. The details of how I made it back are way beyond the scope of this piece, and let me be very clear that it wasn’t easy. It was a struggle every single step of the way, but I had a daily reminder that my hero believed in me. For me, that was a huge piece of ammo in my motivation toolbox. I needed it, and used it, every single day. I did make it back. I didn’t put back on that 75lbs either – it ended up being closer to 100. My strength and agility surpassed anything I had prior and my playing ability was good enough to earn NAIA ALL American status in my final year of eligibility. At Simon Fraser University emulating Dave as much as possible. 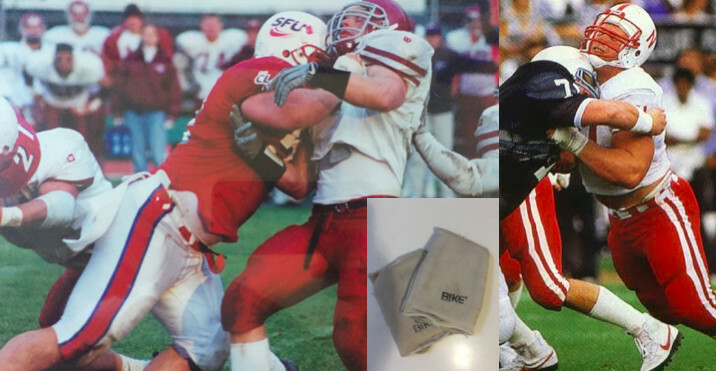 Right down to the very same BIKE hand-shields which I had to search very hard to find as players had stopped wearing these over a decade earlier. All wrapped up in a simple - “Angus, Best Wishes, Dave Rimington.” It’s not the words that mattered, it’s the fact that he cared enough to write them and send it. That’s the power. That’s what matters. As I said, I’m sure this entire exercise maybe took him no longer than 5 minutes, start to finish. And maybe didn’t mean anything at all to him. But it did to me, as I’m sure it would to thousands of people who have heroes of their own. Growing up there were two things that my mom always told me that have really stuck with me. The first was – STAND FOR SOMETHING OR YOU’LL FALL FOR ANYTHING. The second was IF YOU ARE EVER IN A POSITION WHERE PEOPLE WILL LISTEN TO YOU, SAY SOMETHING THAT MATTERS. I’ve tried very hard to live my life by these two rules, but I’ve grown to extend the second thought to this – IF YOU’RE EVER IN A POSITION OF INFLUENCE, BE AS GOOD OF ONE AS POSSIBLE. Athletes today rightly or wrongly have some of the biggest platforms of influence over today’s youth. That is a tremendous responsibility and opportunity. I’ve heard some athletes say that their job is not to be a role model. That it is for parents, teachers and coaches responsible for our youth’s upbringing. Sure, it may not be the job of a pro athlete, but with great influence comes great opportunity. An opportunity to affect all these people that cheer for them, look up to them and ultimately that make up the market responsible for paying them. Why wouldn’t they take this opportunity and make the most of it?  Use the platform to touch people’s lives in a positive and uplifting way. It took a monumental effort for me to make my way back and fulfill my childhood dream. I had the help and support of countless people who I will be eternally thankful and grateful to. A piece of that puzzle though was the simple inspiration from a childhood hero. That inspiration stays with me today. Eighteen years later I still keep his autographed picture framed on my home office desk. I’m proud of what I was able to accomplish in football, even though I never came close to the Dave Rimington standard I chased. I feel content knowing I became a solid pro, a dependable teammate and did what I could to be a contributing member of my community. I would love to let Dave know this and show him how impactful his small gesture so many years ago has been on my life ever since. I also want to apologize to anyone I failed to get back to throughout my career. I’m embarrassed that I didn’t reply to every person that reached out to me over the years. Being too busy is never an acceptable excuse, but seemed convenient to tell myself sometimes. To anyone I missed, I’m sorry. More than anyone, I should know better. You may have no idea sometimes just how impactful our actions no matter how small can be to someone. Particularly someone who holds you in high regard. It’s not about grand public gestures or large social media documented acts. Those are fine and can draw the attention to great causes, but sometimes, the most impactful thing you can do for somebody who looks up to you and reaches out, is simply to reply. Send a positive note or message. It probably won’t do one thing to directly impact your life, but it could very well be the one thing that person really needed on the other end to change theirs, sometimes dramatically. Thank-you Dave. Thank you for taking a few minutes of your time so many years ago to help add much-needed inspiration at a critical turning point in my football career and life in general. Thank you also to athletes everywhere that take the time for their fans. No matter how brief or small. That’s what having that platform is all about. Using it to better someone else’s life, even just a touch. If you have that influence, make the very best use of it. It matters, trust me – I’m living proof.